Search for Red Rocks Amphitheatre tickets at buyTickets.com. Find upcoming events, shows tonight, show schedules, event schedules, parking and seat maps for Red Rocks Amphitheatre in Morrison Colorado at buyTickets.com. Red Rocks Amphitheatre is located in Red Rocks Park near Morrison, Colorado, 15 miles west of Denver. From Downtown, take I-70 west to exit 259, turn left at the bottom of the Morrison exit ramp, cruise on downhill 1.5 miles to the Red Rocks Park entrance. Coming from south Denver, take C-470 to the Morrison exit, turn west and follow the signs to the Park entrances. Here's a tip to avoid some traffic: you can also exit C-470 at Highway 285. Take it west to Highway 8 and then head north to the Amphitheatre! 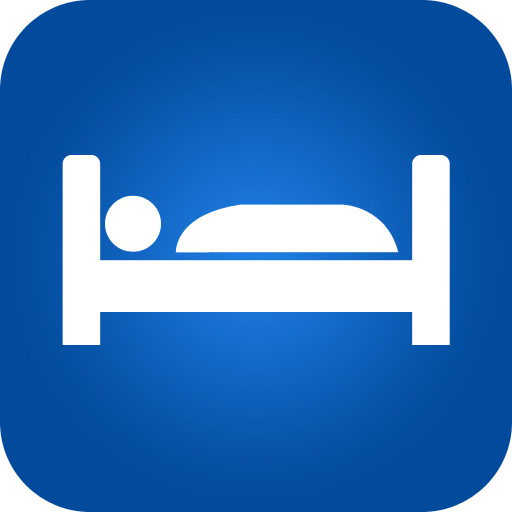 Event days: Open one hour before sunrise – 2 p.m. In case of all-day festivals or early concert start times, the amphitheatre may close earlier. Please check the Red Rocks Phone Recording at 720-865-2494 in case of any last minute changes. Early house closure times are not determined until the week of an event and can change at any time. November - March 8 a.m. to 4 p.m.
April - October 9 a.m. to 7 p.m.
November - March 9 a.m. to 4 p.m.
Red Rocks Park and trails open one hour before sunrise and close one hour after sunset on non-show days. Admission is free to visit Red Rocks Park, Amphitheatre, Visitor Center, Trading Post and the Colorado Music Hall of Fame. The Red Rocks Box Office/Will Call opens four hours before the show. Please check your event on our calendar for door time and event start time. There are four areas patrons can be dropped off (except party buses) to gain access to the venue. Patron pickup is located on Trading Post Road South. 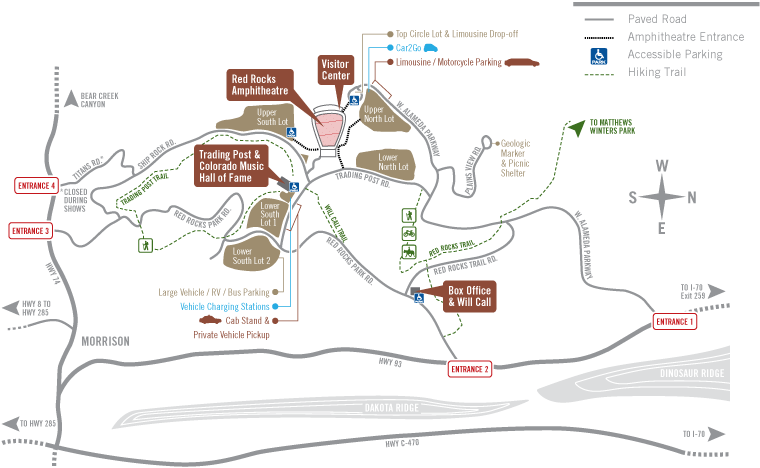 Enter the park at Entrance 2 and head south to the Trading Post Road intersection. Parking attendants will direct you to the closest available parking location. Drivers are required to wait at their vehicle for patrons to arrive. Parking attendants are available for questions and to help patrons find pickup locations. Oversized vehicles are not allowed in these designated pickup areas. Do you have tickets for other venues in Denver, Colorado? Yes, you can find a list on the right side of this page. If you’re looking for other venues in Denver or elsewhere in Denver Colorado, you can also click the link on our City Guides main page. You’ll find a list of other towns and venues in Denver Colorado. Do you offer any promo codes for Red Rocks tickets? Absolutely! You can find promo codes on performer and event pages. Enter them at checkout for additional savings on our already great tickets. What if I buy tickets to an event at Red Rocks that get canceled? If an event at Red Rocks is canceled without being rescheduled, buyTickets.com offers a full refund for the price of the ticket, minus shipping. We also offer insurance on our tickets in case you can’t make an event for personal reasons (restrictions apply). You can find more information about ticket insurance at checkout. You can get in touch with the Red Rocks box office directly, or contact buyTickets.com at 1-855-BUYTICKETS or by sending an email to support@buytickets.com. We’ll do our very best to answer all your questions regarding Red Rocks tickets or any other matters. Hundreds of thousands of individuals from all over the globe flock to Red Rocks each summer for songs, films and awe-inducing geology. Regardless of the popularity of the facility, confusion remains prevalent regarding its performance. Here are the main things to understand about Colorado's marquee venue. Let's begin with the Fundamentals: Red Rocks is the title of an 868-acre park situated outside the city of Morrison at Jefferson County. Inside the park is a amphitheater that's been hosting concerts often. Who owns Red Rocks? The City of Denver owns the park as well as the amphitheater inside Red Rocks is just one of 22 properties run by the Denver Mountain Parks system. The city purchased the property and constructed the amphitheater from an present rock formation with assistance from the Civilian Conservation Corps. Most concerts here are made by private companies, that let the amphitheater. What's the altitude of Red Rocks? 6,450 ft; roughly 1,200 feet higher than Denver. There is also a restaurant known as the Ship Rock Grille and a gift store. If it's a public park, does this mean my tax dollars go to funding a concert site? No. The amphitheater is financed the town earns from fees. What is the potential of Red Rocks? The capacity such as the restaurants, backstage areas and visitor center, is just a bit over 10,000. That is based upon the kind of occasion and the time of year. Red Rocks booking director Jeannette Murrietta states a normal concert prices"upwards of $100,000," such as fees for gear, security, sellers and the place itself. The fee for concerts and other ticketed events is $ 7,500, whichever is higher or an 11 percentage of entrance revenue. Nonprofits are billed with an 8% of the entry revenue. The cost for a personal, non-ticketed occasion (for instance, a wedding, bar mitzvah or cult action ) is $100,000 during concert season -- that operates from May to September -- and this cost does not include the labour and equipment needed to sponsor an event in Red Rocks. $10,000 is billed. 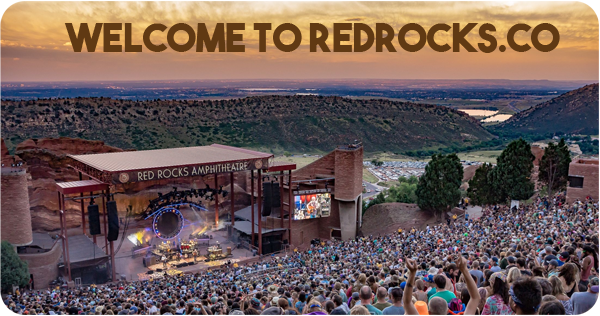 The fee for personal and industrial entities is 10,000.
Who will lease Red Rocks? Anyone. If you have got the money and an idea, you are able to rent the Rocks. Okay, but that really does let Red Rocks? AEG and LiveNation -- both biggest concert-promotion businesses in the nation -- largely split the program for the Red Rocks concert period, though other associations sometimes host occasions. Who is responsible for safety at shows? Argus Event Staffing manages in-show safety. The Denver Police Department provides law enforcement through traffic and security in addition to events around the site. Booking organizations need to pay for police and security presence throughout concerts/events. Who are the sellers? Aramark Sports & Entertainment is the exclusive distributor of meals, beverages and artist product to the place, even though they do utilize a few Colorado organizations to make local products. Aramark is also clean up after events. Great! Marijuana is legal! So I will smoke Red Rocks concerts, right? No. Use and the purchase of marijuana at Red Rocks is prohibited. What's this about a touch wall within the place? Up as they come through this place where musicians may register, There's a an whole hallway. What was the very first concert at Red Rocks? The very first concert to rock the stones happened before the Red Rocks you know and love came to being. Back in 1906 proprietor, John Brisben Walker hosted Pietro Satriano along with his brass ring to perform with the place. Walker hosted audio at the pristine place (aka nature) until about 1927, once the City of Denver purchased the property from him. What about prominent concerts? The very famous Red Rocks concert is most likely that the Beatles in 1964. It had been the only stop on the tour to not sell out. However, there have been hundreds of concerts featuring just about every action in pop music history. Has the park been known as"Red Rocks"? No. When Walker possessed it, it had been known as the Garden of the Titans. The City used employees from the Civilian Conservation Corps. It took 12 years to complete, and it was recorded on June 15, 1941.